Happy New Year! Now that the holidays are over, and things have settled down, it’s time to conquer those new year’s resolutions. Having a proper estate plan in place is one of the most important things you can do for your family. So, I hope you have at least considered, if not made, creating or updating your estate planning documents one of your resolutions. If you have, great! But, be careful. If you are considering the do-it-yourself (“DIY”) method, please don’t. Have you ever heard the concept of fast, cheap, and good and that you can only pick two? Well, it’s true. Hiring an attorney to draft an effective estate plan will be one of two things: (1) fast and good, but not cheap; or (2) good and cheap(er), but not fast. And, if you draft the documents yourself, or complete a fill-in template online, it will be fast and cheap, but I guarantee those documents will not be good. In fact, the DIY method likely will cost you more in the long run than had you just hired an attorney from the beginning. Even if you obtain documents through an online site that has attorneys who are licensed to practice in Maryland, it does not mean those attorneys keep up with the laws, as there is no continuing legal education requirement for attorneys in Maryland, or that their primary practice area is estate planning, as most of these online sites offer services in addition to estate planning. Still, cost is a priority for most people. So, why pay a lawyer when you can get your estate documents online for free, or at a substantially reduced rate? There are three main reasons to use an attorney: (1) knowledge of the law, (2) knowledge of your goals and family situation, and (3) expertise to draft documents that accomplish your goals. First, and foremost, an estate planning lawyer is licensed to practice law and focuses their practice on estate planning, specifically. As such, an estate planning attorney knows the law and can educate and advise you what documents best fit your goals and circumstances. Second, an estate planning attorney will meet with you for an initial consultation usually lasting at least an hour and during which the attorney will discuss your estate planning goals and obtain personal, financial, health, and family information. They will get to know what is important to you and will then use this information to recommend a plan that accomplishes your goals and that is tailored to your specific situation. Additionally, you can ask questions and receive answers directly related to your unique circumstances. Online sites cannot accommodate this. Third, an estate planning attorney will draft customized documents addressing your current situation as well as any concern or possibility that may arise in the future. For example, if you have a blended family, have a disabled beneficiary, or have an individual retirement account, etc., you should provide for these situations in your documents. Unfortunately, online sites have little, if any, room for customization. Rather, online sites provide basic documents that are generic and virtually the same for everyone. 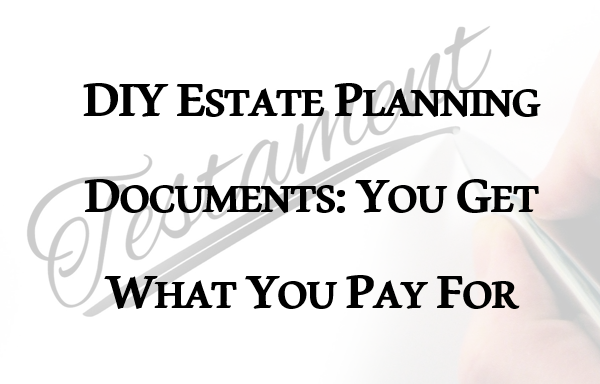 Moreover, DIY estate planning documents are not a good idea. At best, they are poorly written and probably do not say what you think they say and at worst, are invalid because they do not comply with state law. In Maryland, all durable powers of attorney dated on or after October 1, 2010 must have two witnesses and a notary. Recently, a client handed me a durable general power of attorney for her now-incompetent father that she obtained in 2015 from an online site claiming to have a licensed Maryland attorney on staff. The power of attorney was not notarized and thus, invalid. Because her father was incompetent and not able to sign a new power of attorney, we had to petition for guardianship, which cost far more than an attorney-drafted durable power of attorney would have cost. 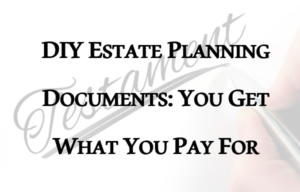 Estate planning can be a very complicated area of the law and so much estate litigation arises as a result of poorly drafted documents. Do not attempt this on your own; do yourself a favor and get help from an attorney.